Under the Taliban it was forbidden to show pictures of human beings, let alone for young women to operate video cameras. Kites tells the story of young Afghans and their yearning for modernity. Through a clever combination of the students' videos and their Polish mentor Jacek Szaranski's artful camera work, we take a look at the use of video and technology in a world more commonly associated with a backward and warmongering existence. 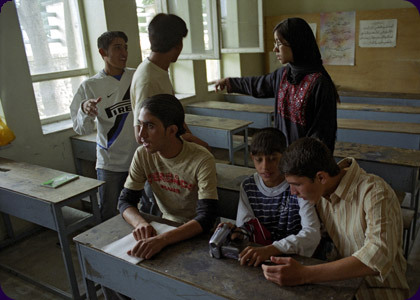 Jacek is holding a month long film course, "Kabul—My City," for twelve talented students from Kabul's Art School. The students are given cameras, some expert tutorials and nothing more. The subjects of their films and the way they show Kabul are entirely up to them. They film their neighbors, children flying kites, and themselves, revealing everyday life that is at times funny and at others, sadly moving. Beata Dzianowicz was born in Katowice. She studied literature, TV and film directing. Beata is a playwright, screenwriter, editor, and theater and film director. She has directed and edited a number of documentary films including A Cell with a View, Dreams and Death, The Art of Conducting, Signs (six episodes), and co-directed five episodes of Words and Signs with Jaroslaw Stypa, for which she wrote the screenplay. She and Jaroslaw Stypa also co-directed Deyna, a documentary about the most famous Polish soccer player. Her most recent project is Kites.